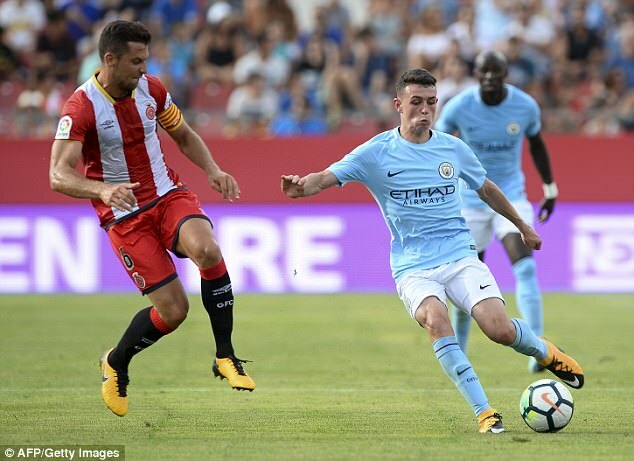 Even as a coach who witnessed the rise of Lionel Messi at Barcelona, Pep Guardiola was rendered momentarily speechless by Phil Foden’s debut for Manchester City. ‘I would like to have the right words to describe what I saw,’ Guardiola told us at Houston’s NRG Stadium in July after Foden had starred against Manchester United. ‘You are the lucky guys who saw the first game. Guardiola knew of Foden’s prodigious talent even before he left Bayern Munich to take over at City. England manager Gareth Southgate, too, has been tracking Foden’s progress since he was 14. Now the whole world knows about the Stockport-born midfielder who inspired England U17s to victory over Spain in the World Cup final in Kolkata, scoring twice to clinch the player-of-the- tournament award. For those who have followed Foden’s career from the start, it has come as no great surprise. He has followed Foden’s progress closely ever since in his role at City, and noted how he has developed into a two-footed player even though ‘the left is still the magic one’. The youngster played for City’s U18s at the age of 15 and a year later was named on the bench for the final Champions League group tie against Celtic. He was rewarded with a first professional contract worth around £4,000 a week in the summer before playing against United on tour in Houston. 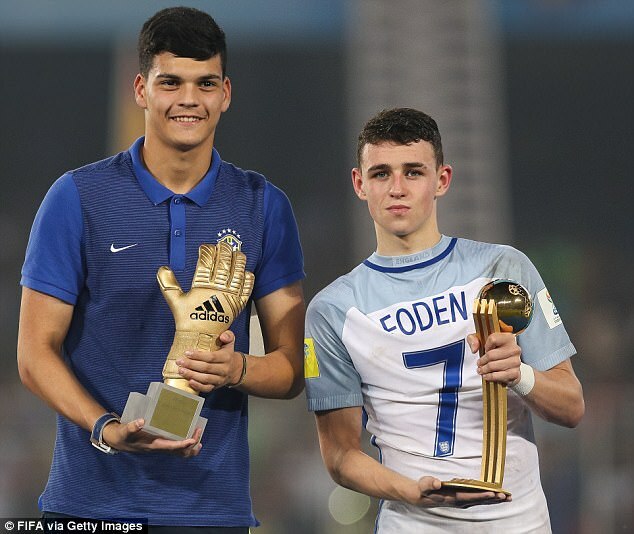 That figure is expected to rise above £10,000 a week when he turns 18 in May, and Foden’s recent exploits in India will only increase his value. His ambitions are unlikely to stretch far beyond the Etihad, however. ‘When he used to play for Vulcans, the scouts always hovered after the game but there was never a danger Phil was going to sign for any club other than City,’ said Makin. ‘I see him like a Paul Scholes. He’s a Manc and that’s it. He signs in each day, trains, toddles off home, job done. ‘He’s the quietest in the group even though he’s the one training with the first team. It’s understood that Foden doesn’t even have an agent, although there has been no shortage of them trying to sign him up. Friends speak of a reserved young man who still goes fishing with his father, also called Phil, who has dedicated his life to supporting his son’s football career. Foden grew up with his dad, mum Claire and two younger brothers in the Edgeley area of Stockport, although the family have recently moved to the more affluent suburb of Bramhall, and studied at St Bede’s College with the rest of City’s academy players. He has come a long way from the raw six-year-old who first turned up for training with Reddish Vulcans at the Peel Moat Centre in Stockport. ‘It was so clear from that first session that he was something exceptional,’ says Steve Williams, his first manager at Reddish U7s. ‘He was without doubt the best talent I’ve ever seen. ‘There were so many moments but two stand out. I remember him scoop-chipping the goalkeeper from six yards out. There were gasps on the touchline, people were so taken aback by it. ‘The other was a tournament in Wales. We’d beaten everybody comfortably and in the final group game we played Phil at the back so he wouldn’t dominate so much. It was notable that England’s triumph in India came against Spain, so long seen as a model for the development of young players. Success at the U17 World Cup, combined with the U20s being crowned world champions and the U19s winning the Euros in the summer, has raised hopes of a golden generation emerging in English football. The part played by St George’s Park, where these stars of the future mix together in the same hotel and can draw inspiration from one another on state-of-the-art pitches the same size as Wembley, cannot be overlooked. Hopefully they will be given their chance in a Premier League that has often been too quick to ignore homegrown talent in favour of foreign stars. Consider this statistic, for instance: 83 per cent of players who featured in the quarter-finals of the Champions League in the last 10 years have played first-team football at 17. So could Foden be the figurehead for a golden generation? ‘Yes, he could be that,’ said Makin. ‘He’s that type of person. He’s got the magnetism and appeal. He goes past people and that gets fans off their seats.